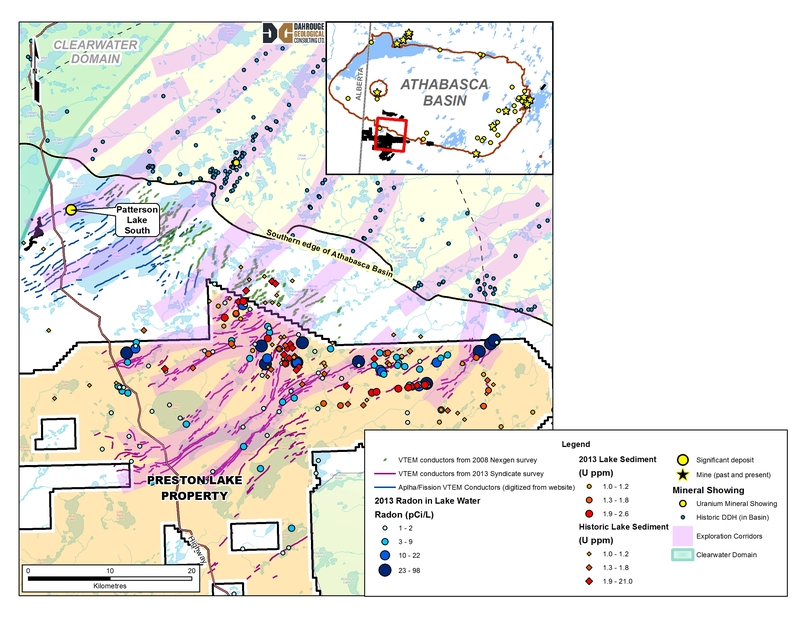 Vancouver, BC - Skyharbour Resources Ltd. (TSX-V: SYH) (OTC Grey: SYHBF) (“Skyharbour”) is pleased to announce that the Western Athabasca Syndicate has commenced a ground gravity geophysical survey at its flagship Preston Lake Uranium Property (the “Property”). Upon receiving the final data from the extensive, three-phased summer field program, the Syndicate’s Technical Team recently met in Cranbrook to evaluate and interpret all of the results and to make final recommendations for the $600,000 winter program. The fieldwork will start with ground gravity to locate areas of hydrothermal alteration associated with known conductors. These areas will be further refined using radon and EM surveys to locate specific targets for drill testing in March, 2014. The 246,643 hectare Preston Lake Property, held by the Western Athabasca Syndicate (the “Syndicate”), is the largest land package proximal to Alpha Minerals and Fission Uranium’s Patterson Lake South (“PLS”) high-grade uranium discovery. The Syndicate continues to employ a systematic, proven exploration methodology that has led to numerous uranium discoveries in the region and throughout the Athabasca Basin. This has been very effective with the summer program yielding numerous high-quality targets with similar geological features and exploratory indicators also present at the nearby PLS discovery. The ground gravity survey will evaluate seven high-priority areas to locate extensively altered basement rocks associated with basement conductors. The leaching and replacement of basement rocks by hydrothermal basinal fluids creates a density contrast resulting in a relative gravity low. Zones of extensive, intensive, alteration are associated with strong uranium mineralization elsewhere in the Athabasca Basin and these anomalies will be used to prioritize and accurately locate areas for detailed radon and EM surveys, leading to specific drill targets. The survey will cover approximately 50 square kilometers and is being carried out by MWH Geo-Surveys Ltd. The 2013 summer exploration program was completed in mid-October in which a total of 42 rock, 653 soil, 404 radon in water, 181 radon in soil, 766 biogeochemical, and 253 lake sediment samples were collected and analyzed, in addition to 1,046 square kilometres of airborne VTEM and 876 square kilometres of airborne radiometric surveys. This was one of the largest regional exploration programs carried out in the Athabasca Basin during the year, with over $1.5 million in expenditures on the Preston Lake property to date. Integration of the geochemical and geological data with the airborne geophysics and historic data has delineated more than fifteen high-priority areas associated with eight highly prospective exploration corridors. The Property’s prospective corridors are very similar to the corridor hosting the high-grade PLS discovery by Alpha Minerals and Fission Uranium (see link below). Management cautions, mineralization present on proximal properties (or ‘corridors’) is not necessarily indicative of mineralization on the Syndicate’s Property. A high potential exploration corridor may be defined as prospective, parallel trends of conductors, magnetics lows, and interpreted structures. These corridors remain largely underexplored south of the Basin, having been ignored historically. However, the Syndicate’s 2013 airborne geophysical data has confirmed that at least eight high-potential corridors extend onto the Preston Lake Property. Moreover, integration of the 2013 summer ground sampling data further enhances the corridor potential with multiple coincident geochemical and radon anomalies. Of the fifteen areas associated with the corridors, the seven most prospective are being followed up on in the current program which will extend through February. This data will be used for final targeting in advance of drilling anticipated to commence in March, 2014. Skyharbour Resources Ltd. is a uranium exploration company and a member of the Western Athabasca Syndicate which controls a large, geologically prospective land package consisting of five properties (287,130 hectares or 709,513 acres) in the Athabasca Basin of Saskatchewan. $6,000,000 in combined exploration expenditures over the next two years is planned on these properties, $5,000,000 of which is being funded by the three partner companies. Skyharbour also maintains a diverse portfolio of precious and base metal projects in the Red Lake district of Ontario. The Company has 43.6 million shares outstanding with insiders owning over 25% of the outstanding shares. Skyharbour’s goal is to increase shareholder value through new discoveries and developing exploration projects in geopolitically favourable jurisdictions.